Even goat can’t see Watusi? I guess his condition is serious! Maybe that was for the best– I can’t imagine the Professor or Mitchell enjoying that fruit basket nearly as much as goat did! If you’re so inclined, you can read about my fondness for SpongeBob Comics— new on my Smeary Soapbox Press-ents blog. 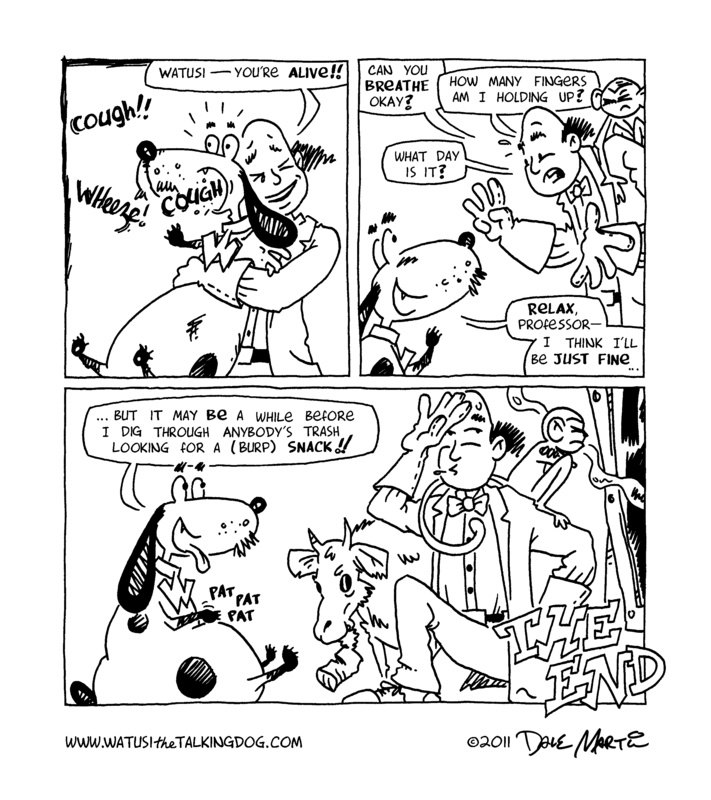 As long as nobody has a deadly allergy to strawberries, Watusi’s peace offering may get him back in the Professor’s good graces! It’s time to put on your game face, alright … looks like a confrontation’s right around the corner! 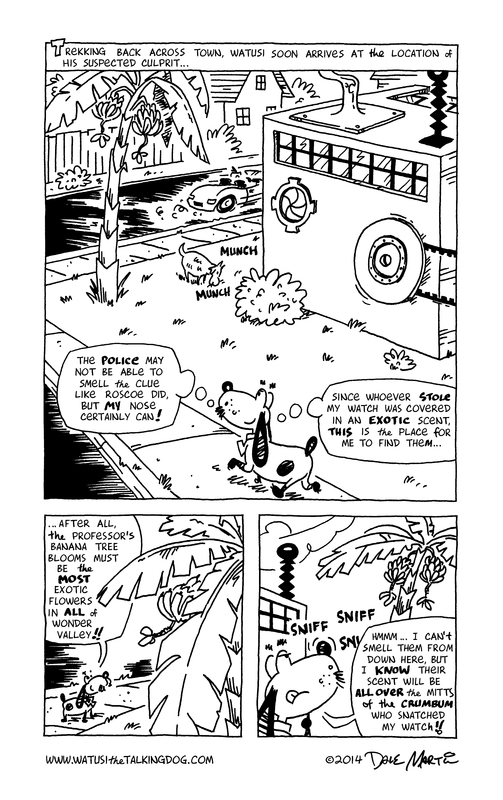 Things are about to get serious for someone in Watusi’s supporting cast! 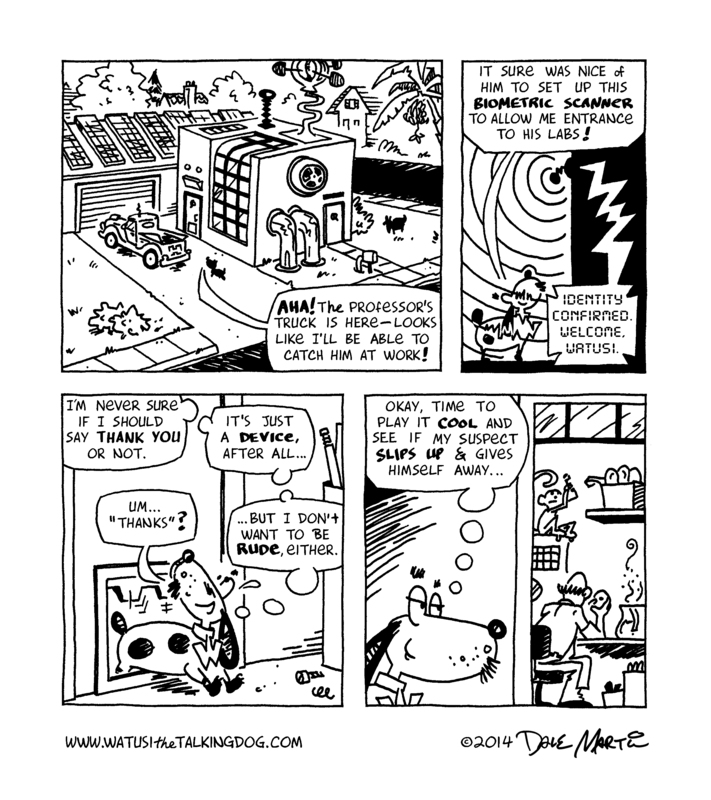 Oh my gosh – Watusi survived!! Guess having a site named “Watusithetalkingdog” kinda takes some of the dramatic tension out of a death scene, doesn’t it? Still, I would be interested in hearing what you thought about this storyline; while I plan to have a mix of these shorter stories and longer epics, I’m curious to hear what you readers prefer! … of course, if you’re attending the Comic Book I-Con this weekend, you can tell me in person! It should be a really fun show, as was last weekend’s Free State Comicon – I’ve posted a few photos from it on Watusi’s facebook page. 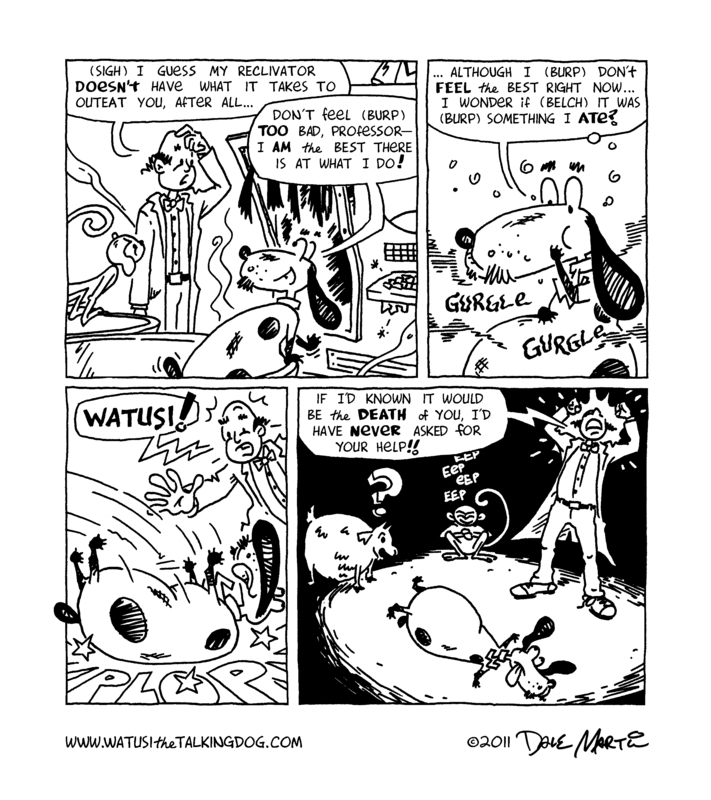 Well, Watusi’s breathing! But is it the breath of life … or a death rattle?!? Next: can it be? Watusi R.I.P.!?! By the way, I want to plug a couple of upcoming shows I’ll be appearing at: Sept. 10th is the Free State Comicon (right here in Lawrence, Kansas), and the very next weekend is the ICBC’s Comic Book I-Con in Altoona, Iowa. I’m looking forward to both shows; stop by and say “hi” if you’re in the neighborhood!